Incite was tasked with designing a social and interactive activation focused around the all new 2018 Toyota Camry at the 2017 Detroit North American International Auto Show. Since there were only 3 production cars in existence at the time, public access to the interior was limited and this pushed us to design the experience around the feature-rich interior. Our goal was to let auto show attendees explore the Camry’s interior; even without physical access to it on the show floor. The technology platform for the experience was a 360 spherical projection system from PufferFish. Using only raw engineering CAD files of the Camry, we designed a life like interactive virtual tour of the interior where users could spin it around, change material & trim configurations, and navigate through informational modals that explained the plethora of new safety and style features available in the car. Tapping the “Start Drive” button would launch the car into a 30 second simulated driving experience where guests could watch the Camry drive through a number of streets in sunny Los Angeles. To bring the social component to the experience, a separate globe became our “Bird’s Eye View Simulator” photo booth, inspired by the latest back-up camera technology featured on the car. Auto show attendees would be prompted to pose for a photo with a hanging 360 camera above. 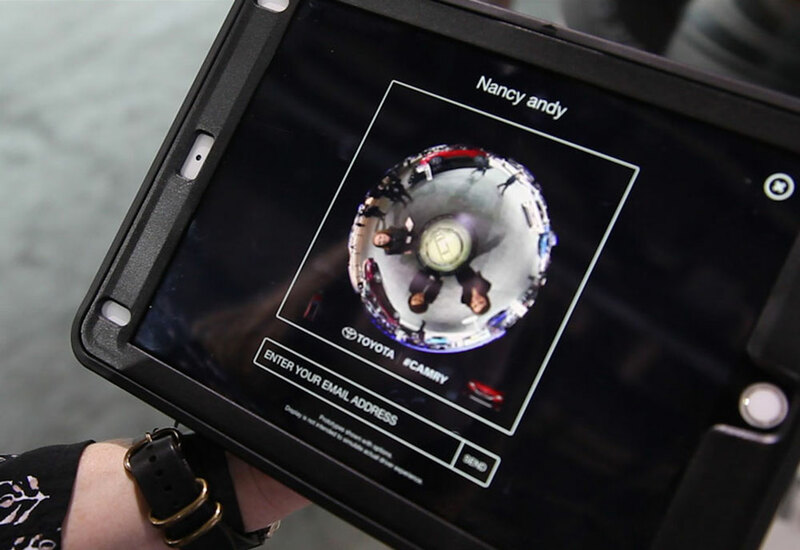 Within seconds, their simulated Bird’s Eye View photo appeared floating around the interactive globe among previous participants. Additionally from the kiosk app, users could email themselves a looping gif style video to post directly to social with #CAMRY.